The Buckingham Stainless 2 Slice Toaster is ideal for toast lovers who want to expand their bread choices. With wider slots you don’t have to slice your bread thinly at breakfast time. Instead you can enjoy bagels, crumpets or larger, thicker slices. It has faster toasting technology meaning you can enjoy tasty toast just how you like it, just a bit quicker – great if you’re in a hurry or making lots of slices. As well as boasting a range of clever functions including a Frozen Bread feature that lets you toast bread straight from the freezer, the Buckingham Stainless 2 Slice Toaster looks good too. It has stylish brushed and polished stainless steel housing and a blue light strip which illuminates during the toasting cycle. 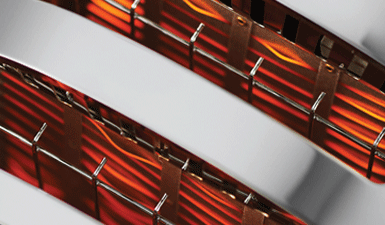 Our specially designed heating element and advanced heating wire give you up to 55% faster toasting*. Ideal for times when you need to make lots of slices or just don’t want to wait around. 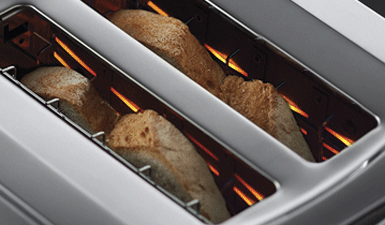 Wide slots, ideal for toasting thicker slices, crumpets, buns and tea cakes. Extra lift for smaller bread types.